We all know that some of the healthiest, and most cost effective, meals are those we prepare at home whether they are a family favorite meal or the classic brown bag lunch. However, there are times, due to travel, or just the plain old busy schedule, that we turn to restaurants for our daily nourishment. When selecting where to eat, when we are away from home, we think about our current mood and tastes, and which restaurant will offer us the healthiest choices. When traveling, it is difficult to select a restaurant when you are not familiar with the area. How will you know the following? One that maintains a high restaurant inspection score for both cleanness and food preparation. One that serves the types of food(s) that you and your family enjoy. One that fits into the price range/budget that you have allotted for your trip. Since "Life is a journey . . ." make your travels easier with a Pioneer Bluetooth iPhone/iPod Navigation AV Receiver. When traveling, some of my favorite franchised restaurants are: Arby’s, Chili’s, Chick-fil-A, Chipotle Mexican Grill, LongHorn Steakhouse, Olive Garden Italian Restaurant, Outback Steakhouse, Panera Bread, Red Lobster and the Whole Foods Market. And as you can see, this list includes not only sit down dining establishments but also a grocery chain who offers a large variety of healthy items on their hot and cold bars. I can depend on finding a meal at one of these establishments that will fit into my healthy eating while on the go routine. At each of these restaurants, I have favorite menu items. And to keep my budget as ‘lean and mean’ as my waistline (ha-ha), I patronize different restaurants based on their value, the time of day and my appetite. For example, at Olive Garden, my favorite time to go is for their lunch as it meets my nutritional and budget needs perfectly. Arby’s, Chick-fil-A, Chipotle Mexican Grill and Panera Bread have one menu for lunch and dinner. Whereas, Chili’s, LongHorn Steakhouse, Olive Garden Italian Restaurant, Outback Steakhouse and Red Lobster have a lunch menu and a dinner menu. Lunch prices are less expensive, and the size of the servings are smaller. The dinner menu offers larger serving sizes along with higher prices. My family and I find that eating a late lunch works better for us since we will have the opportunity to burn off some of the calories during the afternoon. Whereas, eating dinner after we have stopped for the night just adds on the pounds. Using their lunch deals menu options also results in us saving money. And of course, Whole Foods Market sells items on their food bar on a cost per pound basis. For years, my family and I have been Olive Garden fans. Since our nearest Olive Garden wasn’t that close, going there always meant a special trip. However, last year, a brand new Olive Garden opened up literally just a few miles from my door. Now, Olive Garden has become a choice lunch spot. So much so, that when my daughter and I run errands together, we sometimes end up at Olive Garden for lunch. Listed below, also according to their site, are their yummy soups . . . and I do mean yummy! Other tasty alternatives for lunch, included on their menu, are their “Calzones & Italian Sandwiches” as well as a large offering of other delicious Italian dishes. If gluten is a problem for you, then you will also find that some of their dishes can be made gluten-free – talk with your waiter about this option. If you are traveling for business and you are too busy to come in to eat, then check out their “To Go!” menu, and call in your order. It will be ready when you want it. 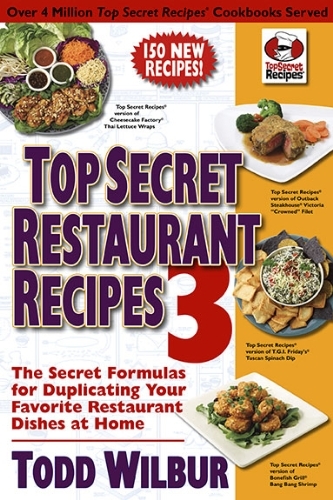 "Top Secret Restaurant Recipes 3" is also available in a hardcover book as well as a Kindle version. As we all know, salad makes for healthy eating whether on the go or at home. One way to make all restaurant salads healthier is to ask your waiter to serve your dressing on the side. Then you’ll be in control of how much dressing you eat. If you want to make this Olive Garden lunch completely meat-free (occasional meat-free meals are another healthy idea), order the “Minestrone.” And just because this delicious lunch special is “all you can eat,” it doesn’t mean you should eat all you possibly can. Remember: “Everything in moderation.” Even this healthy lunch can become unhealthy if you eat too much. I’m a bread lover. So I will think of those ‘bet-you-can’t-eat-just-one-breadstick’ as my dessert for the day and enjoy another one (or two). Despite being a liquid, there are calories in those soft drinks, so I will opt for water, which will save my waistline as well as my pocketbook. I will save even more daily calories by eating lighter dinner fare – especially if I’ve eaten a late lunch. And speaking of lighter meals, be sure to check out the “Leggeri (Lighter Italian Fare)” options listed on both their lunch and dinner menus. Olive Garden lunch specials are wonderful. And if you’re traveling, it makes a wholesome meal for the day. Thus far, Olive Gardens are located in the United States and Canada. So when you are traveling far from home, look for an Olive Garden sign, stop and settle in at one of their tables – it will be like visiting an old friend. So as you wander, visit an Olive Garden for healthy eating on the go. I love the soup and salad lunches at Olive Garden. Great info, SG! If, and when, I get back to CA, let's get together for lunch at Olive Garden. Thanks for stopping by and commenting. I really like Olive Garden. The minestrone soup is the best I've had anywhere. All the soups at Olive Garden are delicious. Thanks, WriterJoanne, for the read and the comment! The olive garden sounds like a great place to go. I have to admit I do not eat out much when traveling. I always think about all those mice and cockroaches you see running around when the healthy inspectors visit restaurants. Plus I live too far away from this restaurant. My mom really likes Olive Garden...especially when they had/have their buy one take one home for free menu. I admit I like it too. Eat some soup and a bread stick and usually I'm full. Take a bite for pasta, end up taking that home PLUS the second free pasta. dinner for a week in this house! I'm tacky and ask if I might have a few bread sticks to take home (lol). I'm sure to give it back in too though...to make myself feel better. Now I'm hungry. Thanks for the info. I love getting deals.